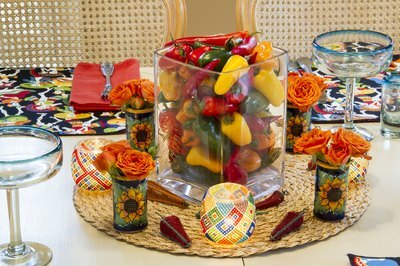 If you're hosting a Cinco de Mayo or other Mexican-themed fiesta, decorate the party table with a themed centerpiece. Make the table centerpieces using bright, fiesta-inspired hues, such as red, green and yellow, along with traditional Mexican decor. When you're planning a celebration on a tight budget, create a centerpiece using items you can reuse or give away as guest favors. You can also incorporate decor pieces you already own into the display to create a customized centerpiece. Place a small Mexican serape, which is a colorful, woven blanket, in the center of the table. Choose a serape with vibrant shades of green, red, blue, yellow and orange to add a pop of color to the table. 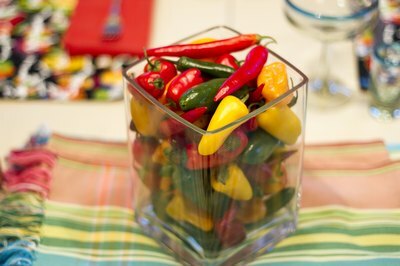 Fill a large, clear glass hurricane vase with a mix of vibrant Mexican peppers. Choose a varied mix of fresh red, yellow and green bell, jalapeno, serrano and habanero peppers. Place the vase of peppers on top of the serape. Place a small lime into the bottom of a large margarita glass. Fill the glass with water. Cut the bloom off of a red or orange daisy or rose and float it on top of the water. 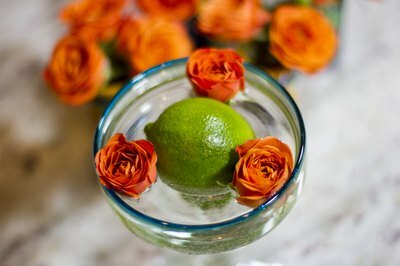 Make one more margarita glass, lime and flower decoration. Place one glass on each side of the pepper display to complete the centerpiece.